– Any portfolio holding is bolded. Market prices are as of end-June, while target prices/valuations are the latest provided (sometime between Jan & end-March). FX rates have been updated. 4 shares that de-listed in H1 have been eliminated. – Always remember any share offering 75-100%+ upside potential is probably that much hairier & riskier! This last point is most important. The problem with any list, or stock-screen, is that you’re forced to look at stocks through a v narrow prism. In this particular instance, it’s upside potential based on target price/valuation vs. current market price. Yes, sure, that’s what investing’s all about – but you need a much more holistic & in-depth perspective of a stock before you’d actually buy it. If I can capture some of that in my valuation, I certainly will try, but sometimes it’s impossible – the risks/outcomes for some stocks are far too unknown/binary. Let’s put it another way – if you were crossing a river, and I told you the average depth was 2 feet, you’d probably feel pretty comfortable, yes? But I said average – how comfortable would you still feel in the 16 foot section of the river..?! And that’s the problem with any single measure, or two – they never tell you enough, especially about risk, which can sometimes be fatal. More generally, I think this is often where bubbles come from – en-masse, investors suddenly lock onto one market/stock attribute, at the expense of all others… It’s amazing in the past dozen years how the solution for each bubble inevitably leads to the next bubble (deliberate, or unintentional?!). The current financial repression (and inevitable inflation) is the only de-leveraging strategy government(s) consider palatable, but of course it sows the seeds of the next bubble. Call it what you will – I call it the great dividend/income bubble. But this is just investors again blindly seeking a return ON principal, except this time they’re not brave enough to chase growth. Not to worry, the brokers, the fund managers, the ever compliant media (funded by their financial sector advertisers), and ultimately the companies themselves have the solution – that is, sell investors exactly what they think they really want. Dividends! Sigh… It’s been interesting to see quite a few UK bloggers discuss this recently, but like all bubbles this one’s firmly centred on the US. I suspect this dividend/income bubble has some years to run, but I’m amazed to already see Ponzi-like behaviour ‘bubbling up’ in the US (un)listed REIT/MLP sector. [Disagree? When companies have to continually fund some/all of their dividend payments from existing shareholder capital, loans & new stock issuance, rather than cash earnings, how would you describe it?!] Eventually, investors will wake up & finally worry about return OF principal, and by then it’s too late, of course – by definition, that’s the sound of the bubble bursting..! 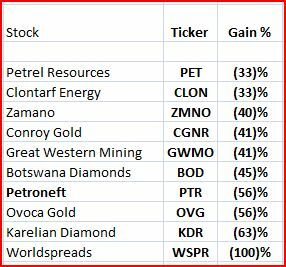 Petroneft Resources (PTR:LN) is only a minor holding for me – the fact my first big Irish holding, Total Produce (TOT:ID/LN), is in 9th place is hopefully another illustration I don’t choose stocks simply on upside potential – no matter how attractive it is! 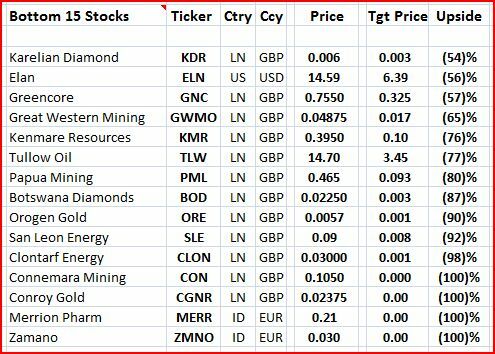 Again, if any of these stocks strike your fancy, DYOR! 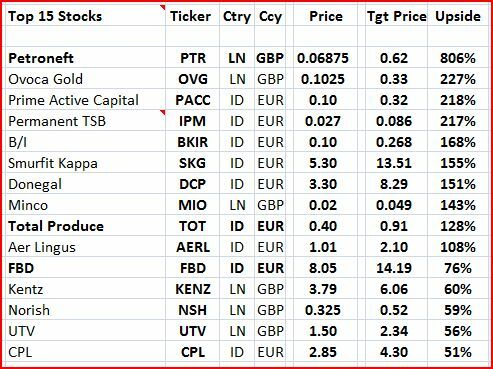 I’m bemused to see: i) 40% of these H1 2012 Top 10 Losers were actually in my original bottom 10 of TGISVP – out of 70+ shares, not a bad forecast at all, and ii) 60% of these H1 2012 Top 10 Losers remain in the new Bottom 15 Stocks chart above, despite their losses YTD! Just goes to prove some shares are never worth it at any price. Reminds me of that dumb old question: ‘At this cheap a price, how much can you lose? !‘ Er…100%? !